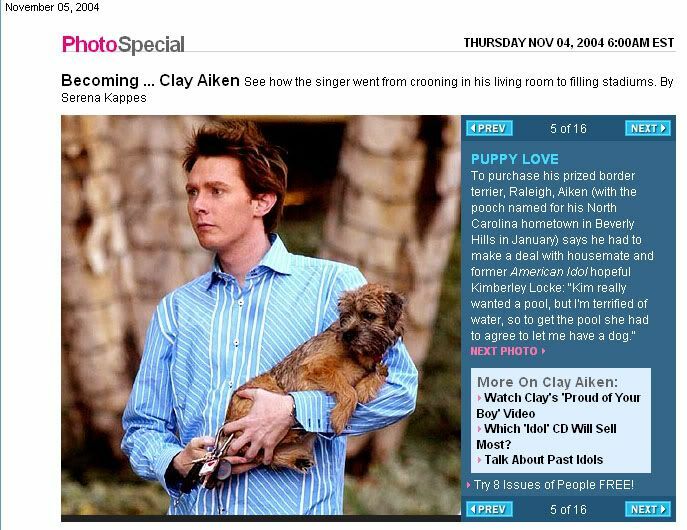 In November of 2004, People Magazine featured a Photo Special of Clay Aiken on their web-page. 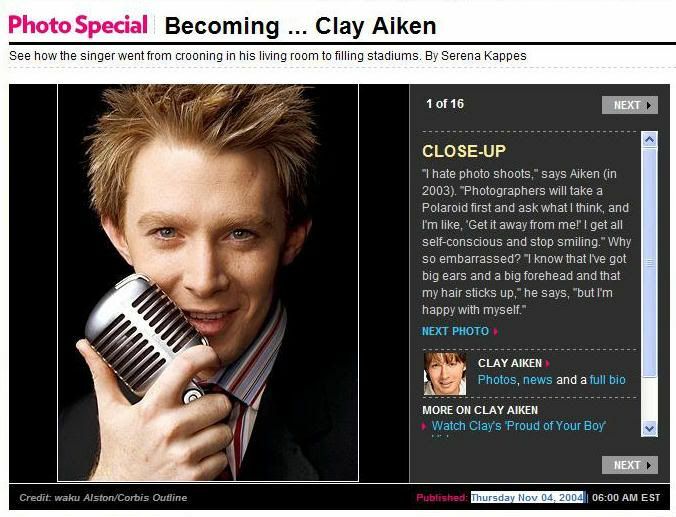 The photo special was titled Becoming…Clay Aiken. The photos ranged from family pictures of a young Clay to pictures of the events Clay was involved in during 2004. There were 16 pictures in the special. Due to space restrictions, I have cut it down to the pictures I think are the most interesting. 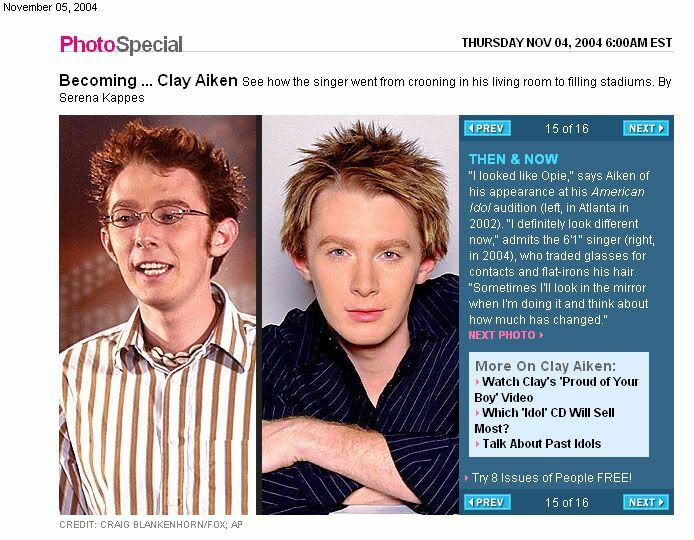 Which picture do you think fits the title, Becoming…Clay Aiken, the most? 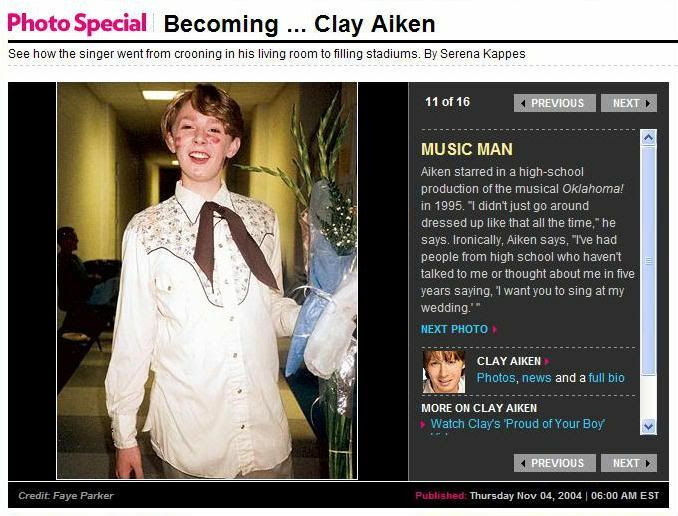 Becoming Clay Aiken… You know, it's been wonderful watching young Clay, and then him turning into the caring, smart well rounded individual. The voice has always been there, but watching him evolve has been wonderful. I am so totally proud of him. I love all the pics, because each of them has made him the man he is today. DANG but you brought back some wonderful memories! I have that magazine somewhere and I gotta say, it's too hard to choose! Looking forward to seeing/hearing more today on Clay and his travels throughout his City. Clay for Congress!! 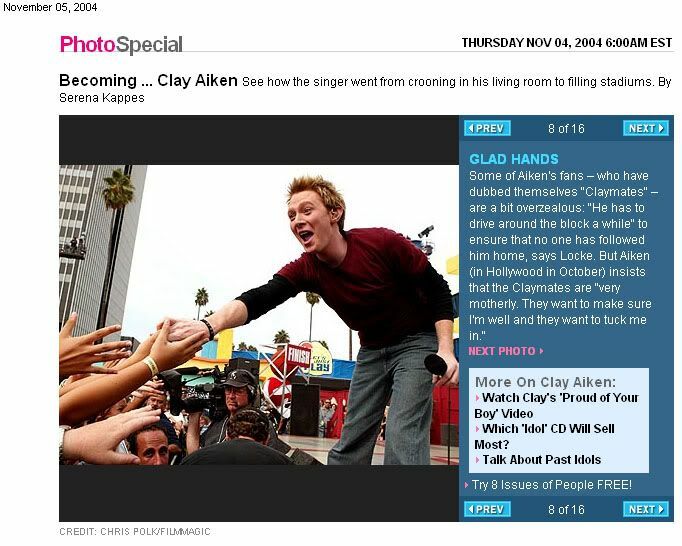 I really look forward to reporting on what Clay is doing NOW…I love the past but want to know what is going on now! 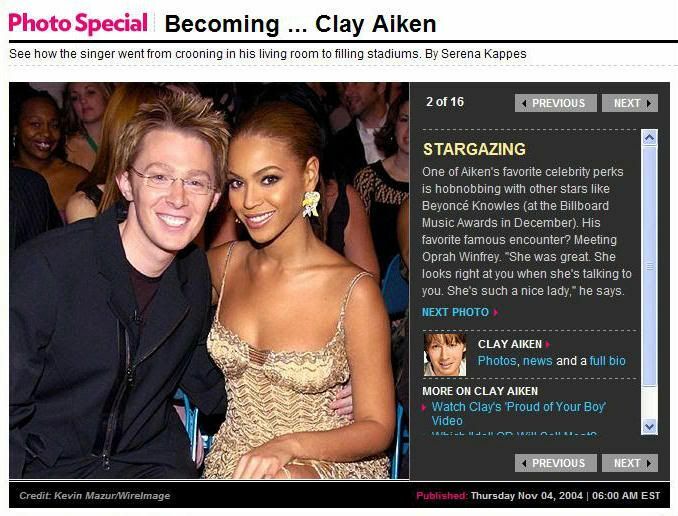 I am so disappointed Clay is still listed on the information part of State of the Union. But when she came on and said who was on the show, it doesn't look like he is there. She did not mention him in her intro. Darn it. I don't remember this, though I probably have it stashed away with many other magazines from the early years. Thank you so much for posting this. Love it. 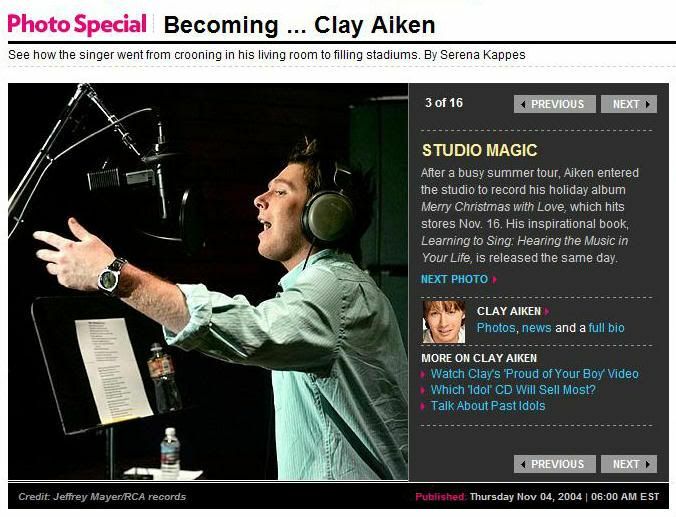 awww, those pics are adorable, thanks Musicfan, hope to see clay on CNN today (maybe) according to what I've heard. I have not seen this before — didn't think I'd missed anything. Just noticed it was on their web page– guess that's how I missed it. Thanks so much–finding new articles and pictures is kind of like striking gold!!! Favourite pic is the one of Clay with his Poppa and Grandma. Thank you MusicFan123. You always do a fantastic job !! It’s very hard to pick just one. They are all great!! Great photos. Still have some of those magazines. 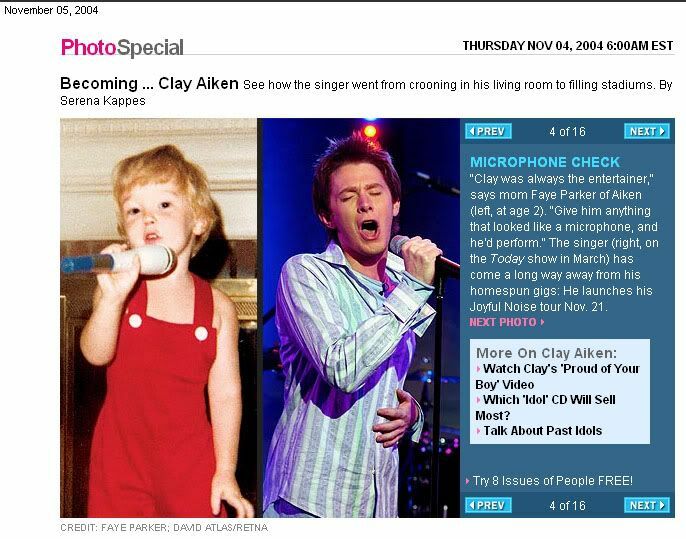 Becoming Clay Aiken – favorite pic for me is transformation from confident singing toddler in red suit to confident adult singer with mic – all those years of singing/emceeing at school, on local stages, and in a band taught him how to release that beautiful voice as a performer and an advocate! Thanks for the memories. I like the last one. You see how much he's changed! They're all great pics! Error: Error validating access token: Session has expired on Tuesday, 21-Aug-18 16:13:01 PDT. The current time is Wednesday, 24-Apr-19 04:52:14 PDT.